Claim "F and G Suites"
Ever been at F and G Suites? How was their customer service? F & G Suites is located along Ade Akinsanya Avenue in Ilupeju, Lagos. 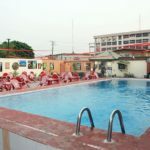 The hotel is in close proximity to Ilupeju Industrial Estate. Free WiFi is available. Each room is fitted with an en-suite bathroom, an air-conditioner, a fridge and a TV with cable service. There is an onsite restaurant and bar where food and drinks can be ordered. The hotel has a swimming pool and a well-equipped gym. Laundry and car hire are offered at a surcharge, and the event facility is available for rent. Onsite and nearby parking are available, and security guards watch the premises of the hotel.